3.7 out of 5 based on 107 bloggers and 14 commenters. 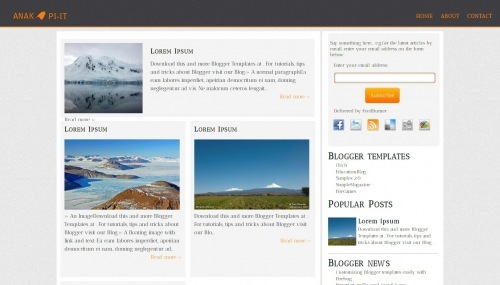 Anak Piit is a free blogger template with 2 columns, right sidebar, an exclusive design for Blogger, social bookmarking icons, posts thumbnails and well designed threaded comments. Thanks a lot. Very nice job. It’s wonderful template. A quick question: how do I remove/edit the Anak Piit header? I have been able to edit everything else that I needed to, but for some reason I can’t seem to figure out how to appropriately rename the blog once the template is uploaded. Any help would be great!